1024x768. ZIP file includes Floydian Font. Yes, you must UNZIP the file and read the readme1st.txt to install!! Thanks to Simply the Best Link for the free font!! ? 's Solusvir@hotmail.com Thanks!!! Woderful idea and concept. Thanks for uploading it. no one has written in here in too long, this logon is awesome. 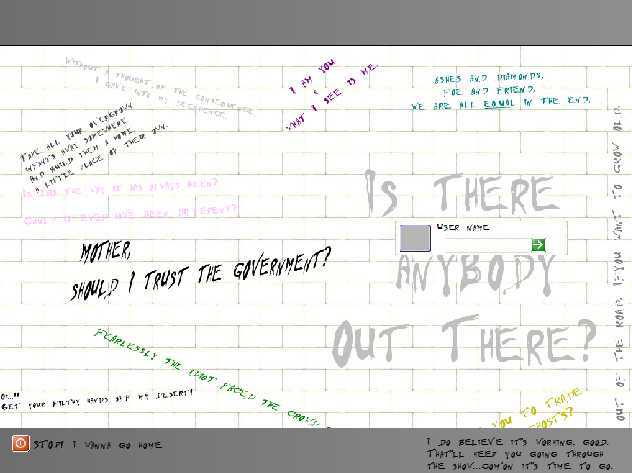 nice one m8, if ya can do more Pink Floyd Logons/wall/whatever, it would be nice . congrats and thx for these 2 nice logons !